Okay, okay, okay. I just wanted a shower. I am not going to say that visiting the valley in summer, on the weekend, specifically on Saturday afternoon, is totally pointless. I learned long ago that absolutes do not, typically, stand the test of time. Almost invariably someone will say, “Not necessarily, it could be that…” Consequently, I NEVER use absolutes. However, if you were to take “Totally Pointless” you will find visiting Yosemite Valley in the summer, during the weekend on Saturday afternoon is right next to it. If you were to collect ALL the points that DON’T make it pointless, wad them up together put them in a pile, it would (probably) be so small, so tiny, so infinitely infinitesimal it could get lost in the shadow of sub-atomic particle; a down quark is the smallest, I think. If those points exist (and I’m sure they do, to which someone will almost certainly attest, should I deny it), they escape me. Let me say that this all started with a desire (not the NEED, ‘mind you) to take a shower. I’m sure most of you young pups feel the need to shower daily. But I, as an older individual, do not. As one gets older, their metabolism slows down and the need to shower is reduced. In fact, that is the very nature of the elderly; the more elderly, the slower the metabolism. I have heard that death can be DEFINED as a very slow metabolism (but, I digress). As I said, all I wanted was to take a shower. I already knew that showers were available, for a fee, for campers in the park. I didn’t know if they were available to campers from outside the park, but then, I didn’t want to travel that far anyway. 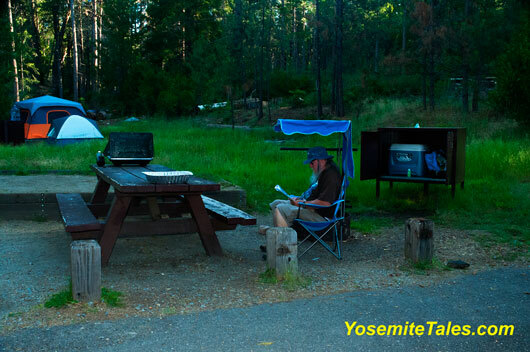 I was at the Dimond-O campground on Evergreen Rd (half way to Hetch Hetchy). So, I first checked with the lodge, there at Evergreen. No, showers are only for guests. But suggested I check with Yosemite Lakes, back down Highway 120 a few miles. I checked with them, next. But, “No can do, Amigo.” Damn, I’m going to have to check in with Half Dome Village. I had done some photography earlier that day, so I figured I owned myself a break and sat down and did some reading about Wawona (which I planned to visit tomorrow). As life goes, the neighbors were beginning to complain and the plant life was wilting due to some air-moble fragrance. I left camp for the valley and Half Dome Village at 1:15 PM. I figured about 35 or 40 minutes to get to the Village, say 10 or so to find out about the showers. If okay, another 20 minutes or so for the shower and the mechanics of same. Then the trip back, all in all, maybe two hours; three, or four, if I stopped for some photos. Worse case—back in camp by 5 PM, but more like 3 or 4 PM. So, I’m off. I get to Southside drive and BLAM. Both lanes full and at a full stop (see feature photo). As I figured, I arrived at the valley at, about 10 to 2 PM; photo was taken after fifteen minutes at 2:05 PM. It’s hard to tell, but this is right about the place that Wawona Road merges with Southside Drive. 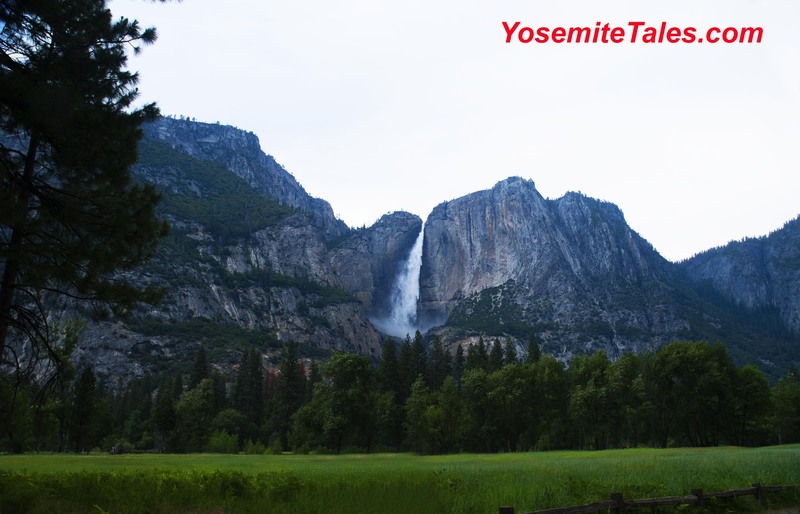 It loosens up, only a little, through the viewing stop for El Capitan and Bridalveil Falls. Then, however, it stops dead again as we see a sign that the right lane is closed and to move to the left. What? The solution to deal with congestion is to take a lane away? Ah, I see, there’s a sign up ahead that says the right lane is reserved for Buses and Emergency Vehicles. Well, okay then. As long as there is a plan, then I’m in. It is about 3:30 or 3:45 PM before I am parked at registration for Half Dome Village. From there, I walk up to a registration person. I asked about the shower policy. They said that whether you are camping in the park outside the park, you are welcomed to use the showers (for a $5 fee). In fact, the $5 even includes access to the pool! That’s nice to know…maybe next time. There are two problems with that for now. First, I didn’t bring a bathing suit. There was a time in my past where bathing without a suit would not be a deterrent, but that was yesterday (and to borrow a line from Chad and Jeremy, “Yesterday’s Gone”). Anyway, I would not like to be confused for a Trump supporter (I can hear it now, “Look! He has short fingers, too!” But, I digress). Also, and more to the point, I don’t have the time for a swim. She shows me a map on how to get to the shower house. I asked if I can stay parked at Registration and go directly to the showers? Oh, no. you’ll need to park in the lot. Not only were there no spots available, there had to be about twenty vehicles looking for spots. Well then, maybe I should just go to day use parking and take the shuttle back. It does take a while to get there and after traversing the newly installed traffic circle that needs to be navigated to get to day-use parking, I come up on the entrance and it is CLOSED! Don’t tell me it is full! It can’t be, I see people (in cars) in there ARE empty slots. After another 100 feet and 10 minutes, I get to another entrance, which was opened and manned by a park ranger. He was there to give instructions on where and where not to park. It is about this time that I remembered something else. If you take a close look at the picture (above) of me reading, in the bear locker, to the left, is my ice chest. That green thing sitting in front of it is my liquid soap, which I didn’t put in my bag of clean clothes, towel and toiletries. Ooops. So, I’m going to have to go to the village store anyway and get some soap. Which I do and, which, takes a good 35 or 40 minutes. I was fortunate enough to immediately catch a shuttle, which was just two stops from Half Dome Village. Yea. I arrive at the showers at 5:20 (scared to death they closed at 5) Not a problem, the Showers are open 24-7, but the pool closes at 6 PM. I get inside and discover they HAD soap and shampoo available in the showers. Who knew? So, to make a long story longer; I get done with the shower and head out to the shuttle stop for the ride back to day use parking. I wait for a few minutes. There is almost no movement of vehicles (including buses) moving out of Half Dome Village. In fact, I’m not sure, but I think I see the shuttle I road in on still there! Not hopeful. So, I decide to walk back to day use parking. The rest of my journey was uneventful. I arrived back at my camp at 6:48 PM. A five hour, 32-minute shower. Boy! Has my clock been cleaned!